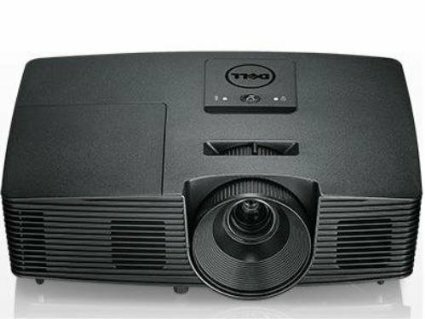 Although it was launched five years ago, the 1610HD remains a staple in Dell’s line-up of projectors. There is a lot to love about the 1610HD. It delivers substantial brightness, 3,500 lumens; it’s light and portable; image quality and color performance is accurate and without minimal distortion. And it’s priced just right: The projector starts at $749 from Dell. One thing to consider: the Dell 1610HD is a WXGA resolution (1280×800) projector. That’s an improvement from many data projectors in the XGA resolution, but it leaves something to be desired when projecting Full HD (1920×1080) content like video and images. In other words, as a data projector the Dell 1610HD is an incredible data projection tool – for classrooms, churches, and businesses. But it’s not the best replacement for the home theater: The lower resolution just doesn’t hold up when running movies, video games or 3-D content. So if you need a presentation tool – with occasional video – this projector will help you accomplish that. But if you use video frequently, you’d be better served upgrading to a Full HD projector. Great Image Quality, Color Performance: Backed up by the 3,500-lumen output and a 2,100:1 contrast ratio, the DLP-based 1610 creates crisp and vibrant images. Plus, the projector is equipped with BrilliantColor technology to enhance the colors. In some cases, the output can be somewhat muted, but for presentations, black-on-white text has great clarity with mild rainbow artifacts present. Performance, in other words, is above average when it comes to data images. Long Lamp Life: Compared to similarly priced DLP projectors, the Dell 1610HD gets long life from its lamp. In standard operating mode, the lamp is rated at 3,000 hours of life, and in economy mode, the projector can run for up to 4,000 hours. If buying used, the Dell 1610HD replacement lamp and module, also known as 330-6581, is affordable – at just north of $205 for the lamp and module. Useful Portability: In terms of size and weight, the 1610 is super portable. It measures 3.5×11.7×8 inches and weighs about 5 pounds. This projector can go wherever you want to take it, and it comes with a standard carrying case. Unfortunately, the zoom ratio is below average, at 1.2:1, and there is no lens shift. So you operators are a little limited in terms of fitting the image to the screen. 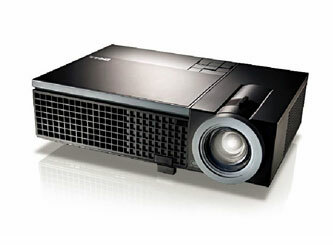 A Variety of Connections: For a projector released in 2010, the 1610 has all the connections you can expect from similarly priced projectors – even those released today. The 1610 has an HDMI port, 2 VGA input ports, S-Video, 3 RCA connections, and a USB-B port, which makes it possible to hook up a wireless remote. The one useful connection its missing is the USB-A, which enables operators to plug-and-play content from a USB drive. Competent Audio Output: The 1610HD is equipped with an 8-watt speaker that provides enough volume to fill small- to medium-sized spaces. Yet, in the noisiest locations, operators may opt for external audio, as at higher volumes, some have noted there’s noticeable distortion. Average Video, 3D Performance: The biggest pitfall of the Dell 1610HD is its video and 3D performance. Video can slightly lag, and although it’s capable of displaying Full HD content, it has to be scaled. 3D performance, on the other hand, is a bit below average for a $749 projector. If you rely on video or 3D content, you might opt for a Full HD projector. For the price, the 1610HD provides what presenters are looking for: contrast and brightness, a range of connections, and lightweight portability. The Dell 1610HD holds its own these days, compared to projectors released in the last 6 months. Unfortunately, the video performance seems a little dated. But if you use video only occasionally, you won’t likely notice. If you’re looking for a budget projector for the classroom or a conference space, you can get a lot of useful hours out of the 1610HD. For the price, the recently released Dell 1220 is a suitable piece of hardware for presenters, combining a useful suite of work-ready features and excellent lamp life. The price is pretty much unbeatable, and it might be one of the most cost-effective solutions on the market. The 1220 starts at just about $325 MSRP. Even for such a budget-friendly projector, though, the Dell 1220 holds its own in a few areas. It’s compatible with a wide-range of devices, there are plenty of connectivity options and ports, the lamp is bright enough to handle its own in well-lit spaces, and the 1220’s lamp life is very long compared to other projectors in the class. The biggest downfalls though are its portability – it’s not the easiest projector to tote from presentation to presentation – and, as a low-cost set-up, the 1220 does have a no-frills feature list. Brightness: Rated at 2,700 ASNI lumens and aided by DLP technology, the Dell 1220 casts a brilliantly bright image. That’s an ideal option for a presenter, because it’s not always easy to control the lighting in a room. Compared to other projectors in the price range, the Dell 1220 is one of the better options, in this regard. Overall, the projector creates a crisp, detailed image – for the price – in the SVGA resolution and a 2,200:1 contrast ratio. Lamp Life: The 1220’s lamp is long-lasting. Dell says the lamp-life, in standard mode, is 5,000 hours, and in the eco mode, lamp-life jumps to 6,000 hours. That’s above average for most projectors in the price range, and another reason this is a solid piece of hardware. Connectivity: The 1220 was designed as a business and classroom presentation tool, and that’s evident in its many connection options. It’s designed to connect with laptops, notebooks and tablets through an HDMI or VGA connection. There are also RGA and audio-in ports. The one glaring omission is a USB port; the Dell 1220 is without, which diminishes its portability. Weak Audio: Built-in speakers are perfect for on-the-go presentation. Unfortunately, the Dell 1220 is a little underequipped in this regard, featuring just a 2W speaker. That might be fine in smaller spaces, but in larger, noisier presentation halls, that just won’t cut it. Plus, comparably priced set-ups generally feature more powerful built-in audio. Portability: If you travel a lot, this probably isn’t your projector. In addition to the lack of reliable audio, the 1220 is a little too bulky to be considered portable, measuring 12.38 inches X 8.8 inches X 3.45 inches. Plus, the lack of a USB port for a thumb-drive presentation is another reason this isn’t the best portable projector. Less Set-Up Flexibility: Finally, the Dell 1220 features a below-average zoom ratio – just 1.1X – and there are no lens shift capabilities. That limits set-up options, and can make it more difficult to fit in some spaces. The Verdict: Is the Dell 1220 A Keeper? For the business traveling set, the Dell 1220 isn’t the right option. It’s a little light on features, and it’d be fairly difficult to carry with you and set-up day in and day out. But the 1220 is a decent, low-cost option, especially for those considering a more permanent mount. And for the price, the data image quality is sufficient, the lamp is bright, and there are options for connecting your devices. If those sound like the features you want and your budget is tight, this is might be the projector for you.